Our third presenter gave us a taste of what Windcatcher can do. If the wind could sing to us, what would it sound like? Would it sound magical, delicate, and melodic? Perhaps it would have a polyphony of voices which articulate its fundamental source and the objects it comes into contact with, infusing it with rhythms, bass, and sweet melodies? Whether its song is a roar or a whisper, a gust or a ﬂurry, with Windcatcher, the wind has a voice. Windcatcher is an art installation that exempliﬁes the creative potential of wind as a source of sound, energy, beauty, and inspiration. Three kinetic sound sculptures become the sources of sounds produced as a result of wind interacting with different physical materials and electronic interfaces. These three specially designed instruments: an Aeolian harp, chimes, and musical wind turbine, together create music played by the wind. The ‘wind orchestra’ produces melodic, harmonic, and percussive sounds, each instrument having its own unique form and function As an artwork, Windcatcher challenges negative perceptions about wind energy and highlights the majesty and beauty of nature and the wind itself: sounds created and manipulated by the undulating ripples of the wind. relationship between humans, technology, sounds, and fish. 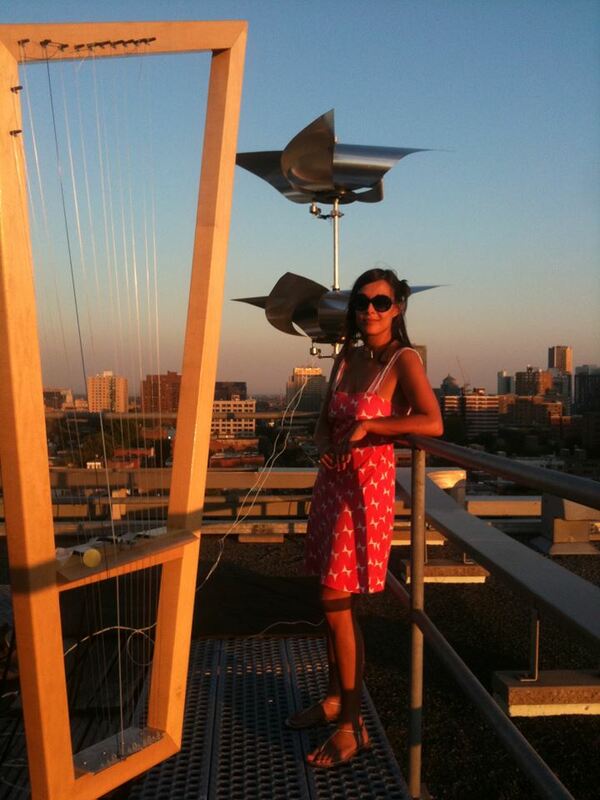 And Windcatcher, where she designed and built three musical instruments played by the wind. Musically-speaking, her heart lives deep in the underground: she founded the nomadic Blackbox parties in 2011, released her debut album ‘Under a Midnight Moon’ on Montreal’s Archipel Musique in November 2012, and has recently begun putting out a plethora of esteemed releases as well as performing her own music live, addicting new audiences to her unique brand of dark, deep, intellectual and alluring electronic music.